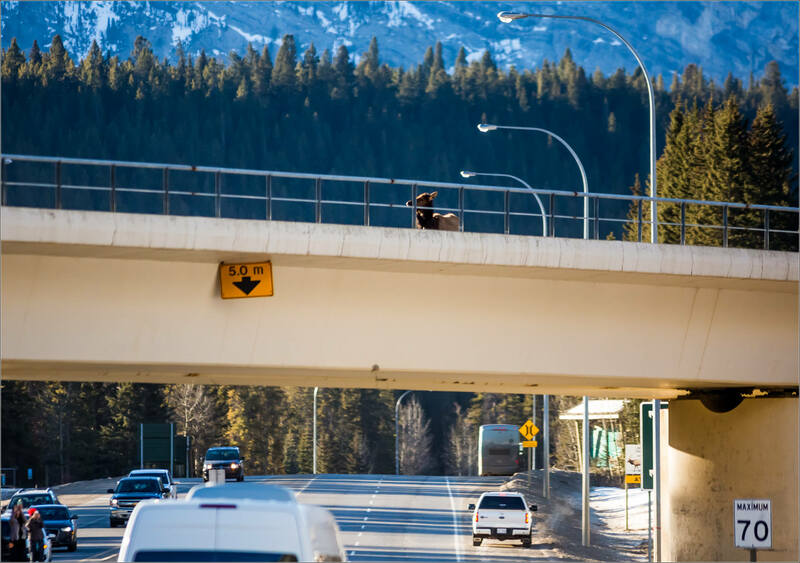 The story of the Banff wolf pack’s takedown of the elk last Sunday begins for me where Banff Avenue goes under the Trans-Canada Highway. I had spent some time along the Vermilion Lakes, then the Bow Valley Parkway and was heading for the Lake Minnewanka Scenic Drive. At the stop sign I looked south for oncoming traffic and noticed movement up on the railway overpass. 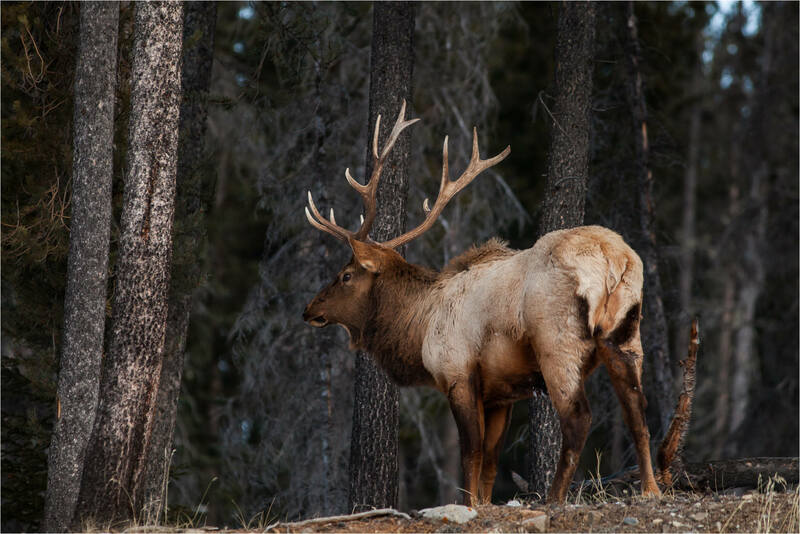 Pulling off the road, I could see an elk from the shoulder up – the body blocked by the solid concrete side of the bridge. 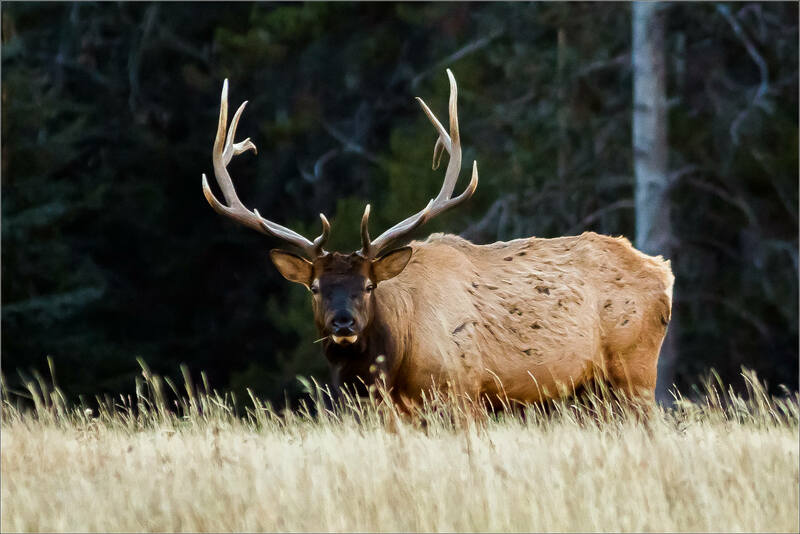 The elk took a couple of paces, doubled back and then repeated that a couple of times. It seemed unusual behaviour so I trained my telephoto lens on her to have a better look. 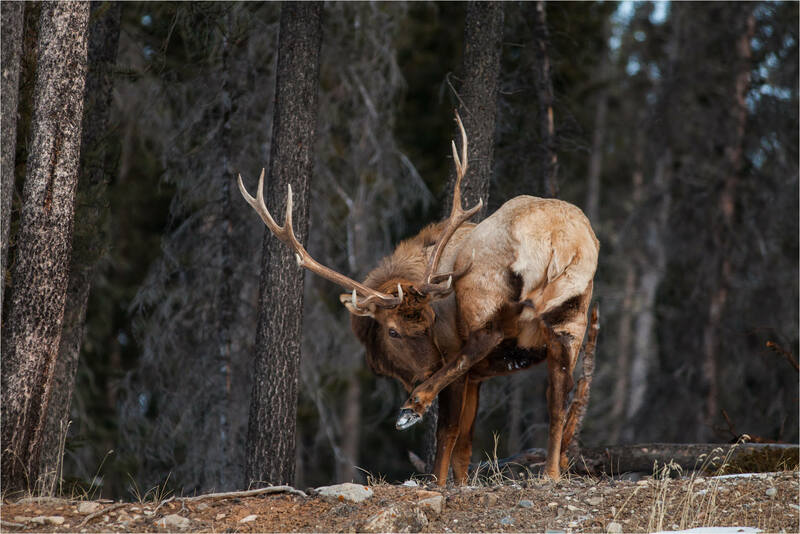 When I did, I couldn’t make out anything unusual – until a wolf’s head came into view when it leaped up and bit the elk’s neck! At that point, part of me was in amazement but the more important part got to work. I ran up the small hill beside the bridge to get level with the animals. 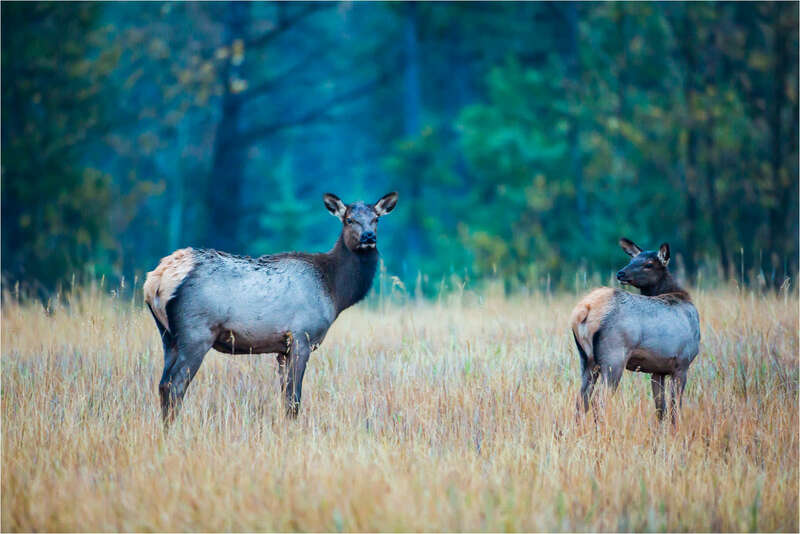 As I did, I could see four wolves (although the pack has five members; I just don’t have one photograph with more than four but all five were likely there) surrounding the elk. 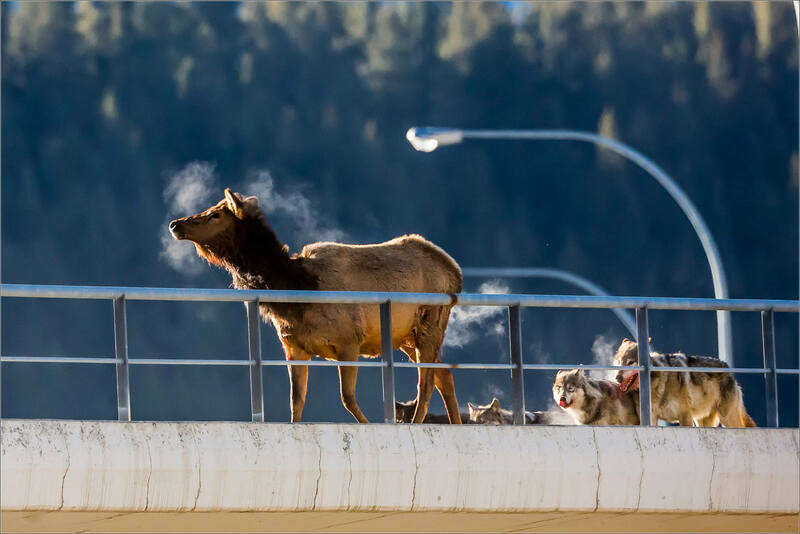 I did not see what led to the elk being on the bridge but suspect it was herded there by the wolves. 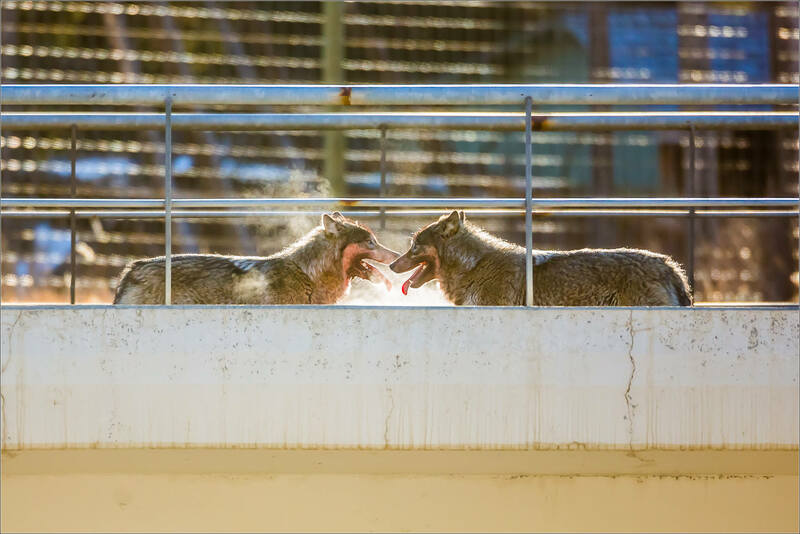 Over the next seven minutes, the wolves alternated between attacking the animal and walling it in on the bridge. Both the herding and the attacking suggested great intelligence and teamwork. The large male, likely the alpha, which primarily attacked the face and neck alternated initial lunges with the other wolves at the back. 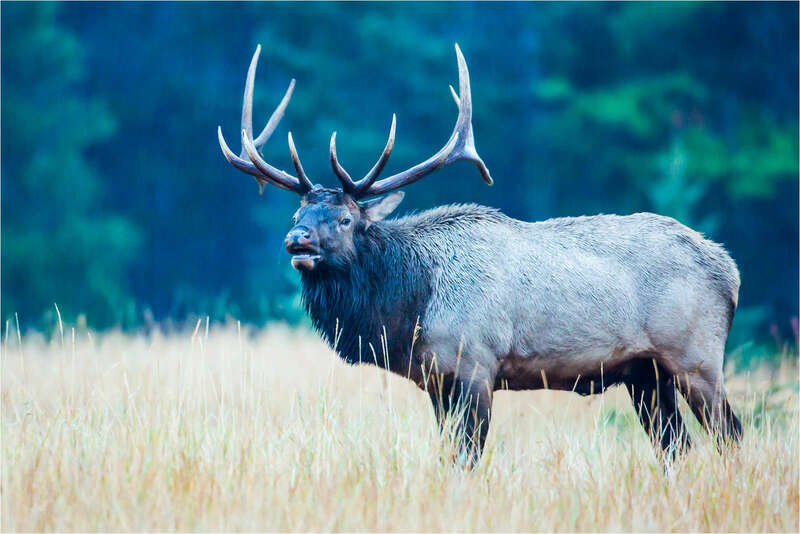 Whoever went first would dodge and parry the increasingly weak counters by the elk while the others would bite viciously while her attention was distracted from them. 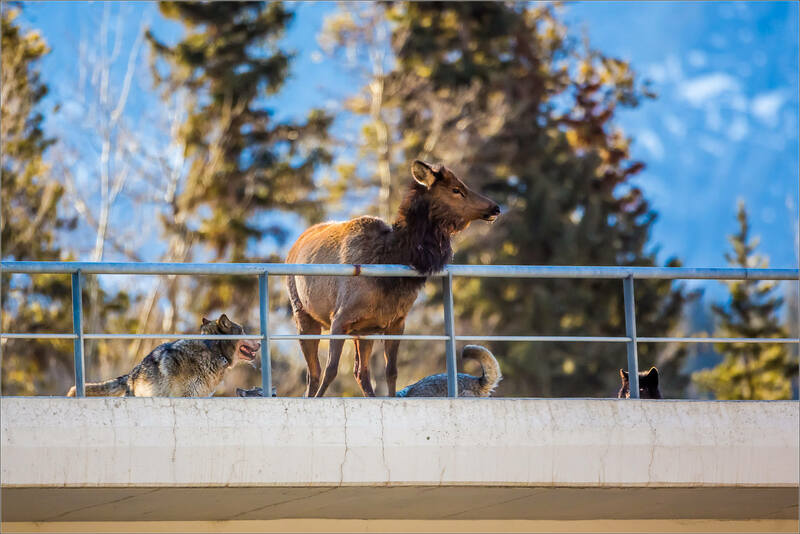 When the elk would get closer to one of the ends of the bridge, the wolves would line up along the edge and force her back towards the middle. During the struggle, she was pulled down twice and recovered her legs before being taken down for good by the alpha in a twisting move of immense power. The cold air, it was about -15°C at 10AM when I came across the attack, condensed the breath and the heat from the open wounds into steam that added to the poignancy of the scene. 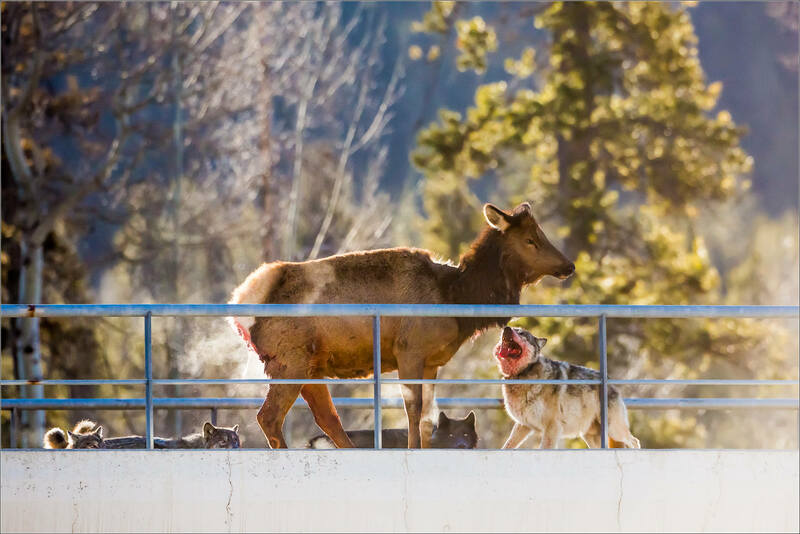 When the elk was down, the pack wasted no time in starting their feast. 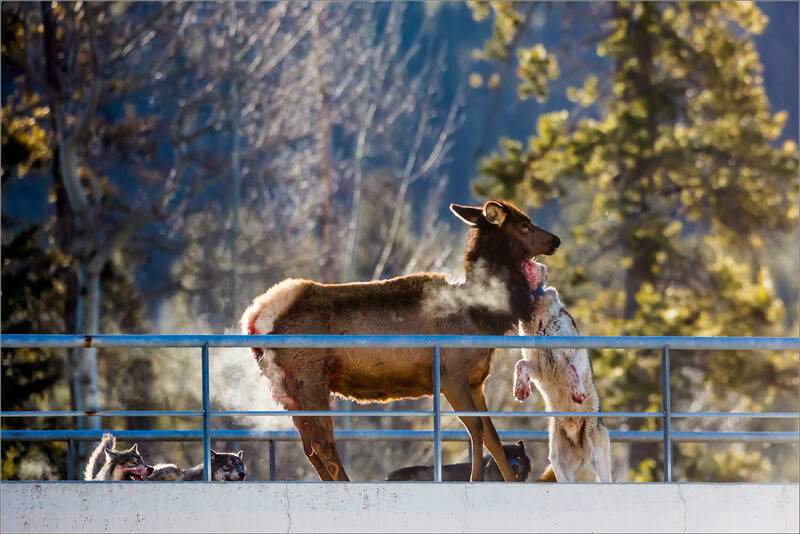 They had about 45 minutes before the carcass was removed which gave the whole pack time to get at least one full meal down. 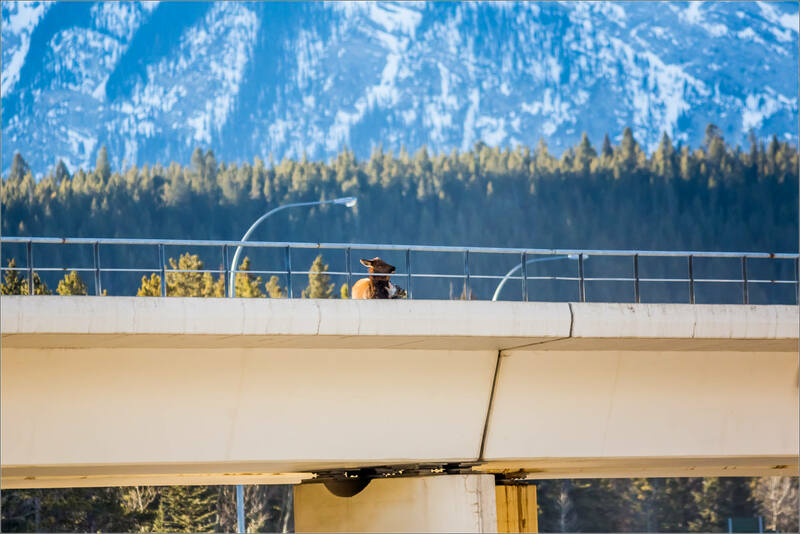 Parks Canada has said that the elk was removed due to the location beside the tracks in the middle of the bridge and the danger that would pose to the wolves and the other animals the kill would attract. I fully agree with that and hope the carcass is taken to a location where the pack can find it again whenever that decision makes sense. 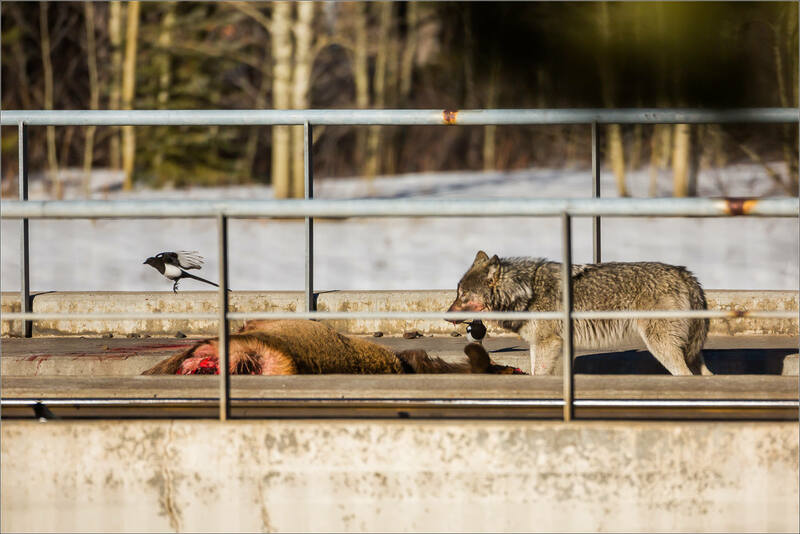 I had hoped they might move the carcass to another location immediately but there are a number of factors involved in making those decisions. I respect the Parks Canada people that follow these wolves on a daily basis and believe they will continue to make those calls with the best outcome for the wildlife. 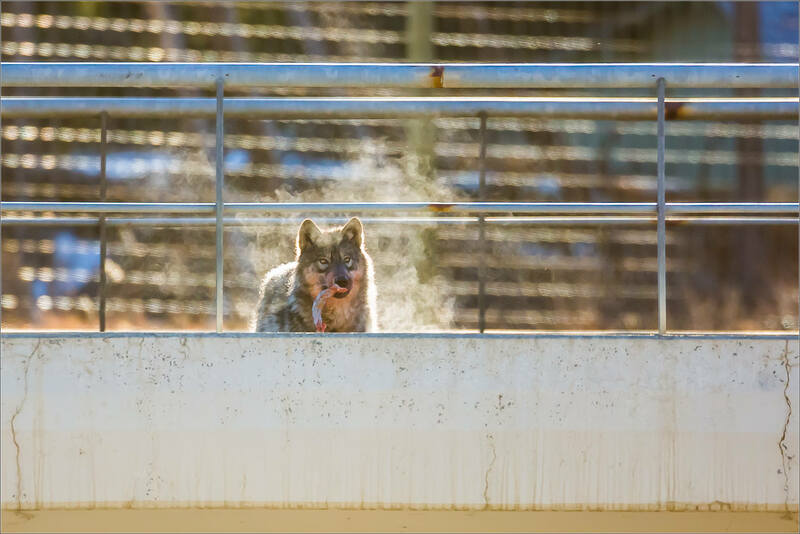 I certainly appreciate their work getting the trains slowed down for a period of time after the attack and giving the wolves a decent amount of time before the elk was moved. I will post a few more images a little later but wanted to share the story as I saw it now. 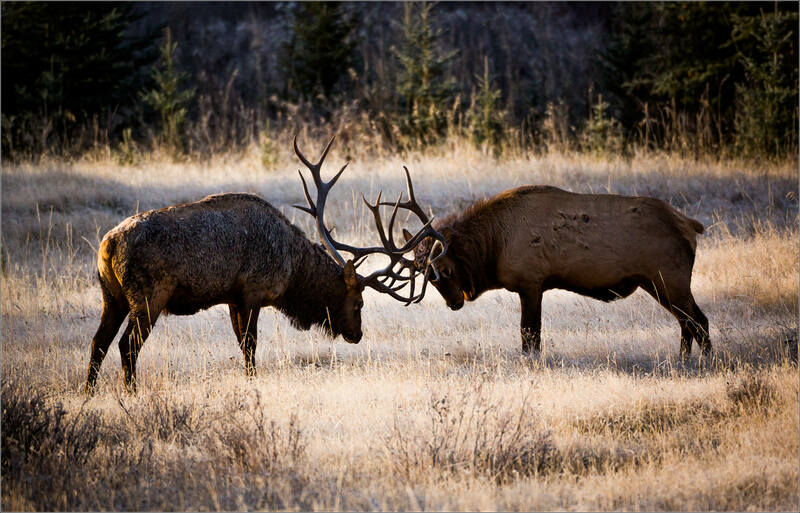 On the weekend I was able to watch an amazing encounter in the Banff National Park. 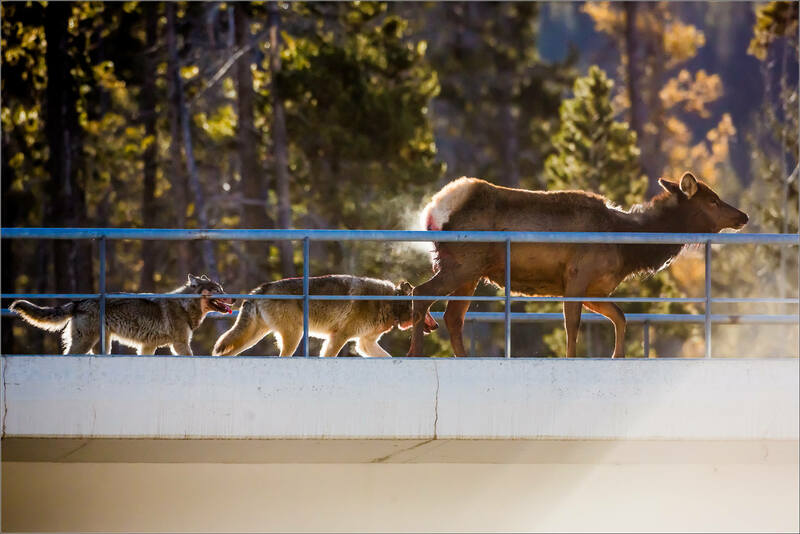 A pack of four wolves hunted and took down an elk on the outskirts of the Banff townsite. 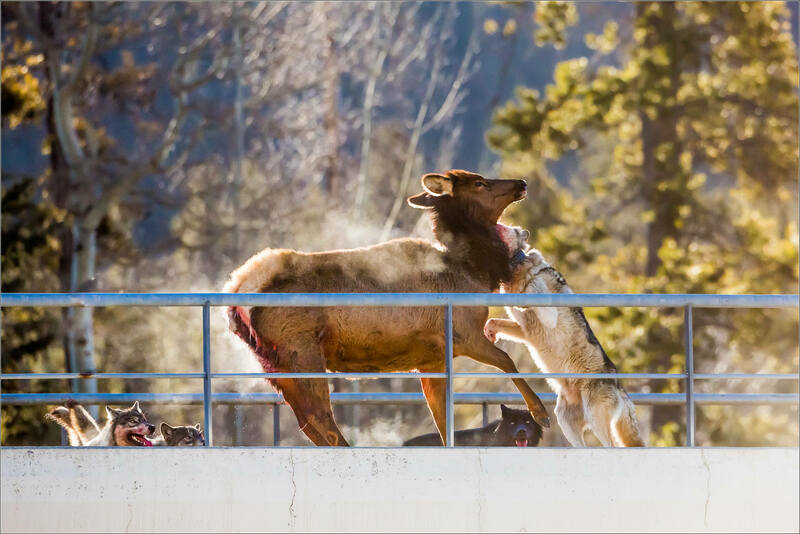 The wolves had trapped the elk on a train overpass and wore the much larger animal down with continuous lunges and bites. I will detail how the scene unfolded in an upcoming story but I wanted to share this image while I had a few minutes. Watching this was a window into survival in nature and I came away in awe of the victors and their tenacity, intelligence and cooperation. 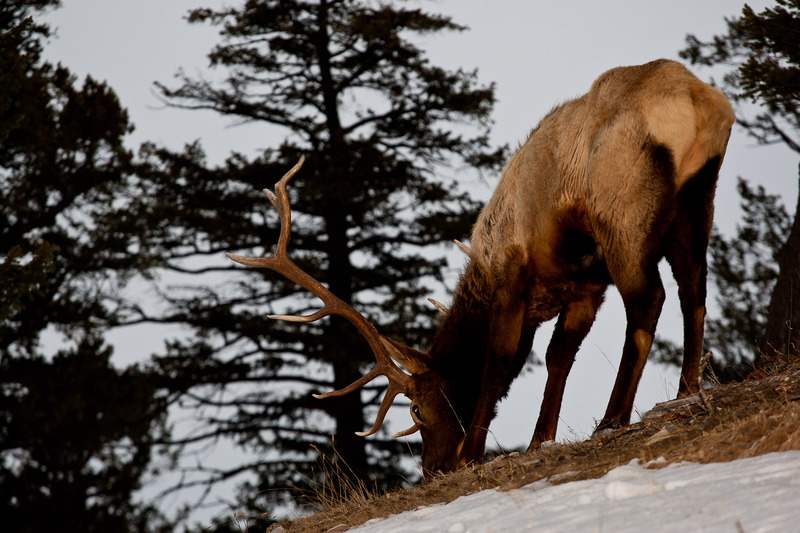 A shadow of sadness for the elk was a part of this story and I gave thanks for what that life lost meant to this pack. 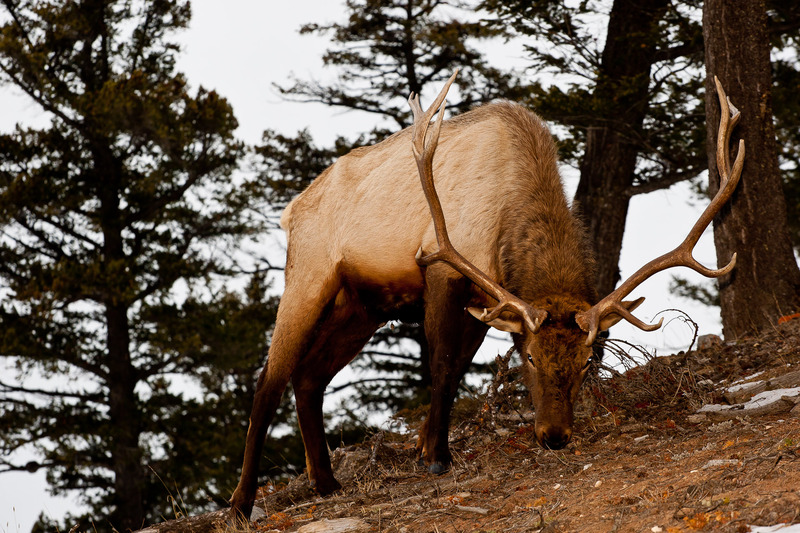 I met this handsome fellow, a bull Elk, in a meadow near Lake Minnewanka. 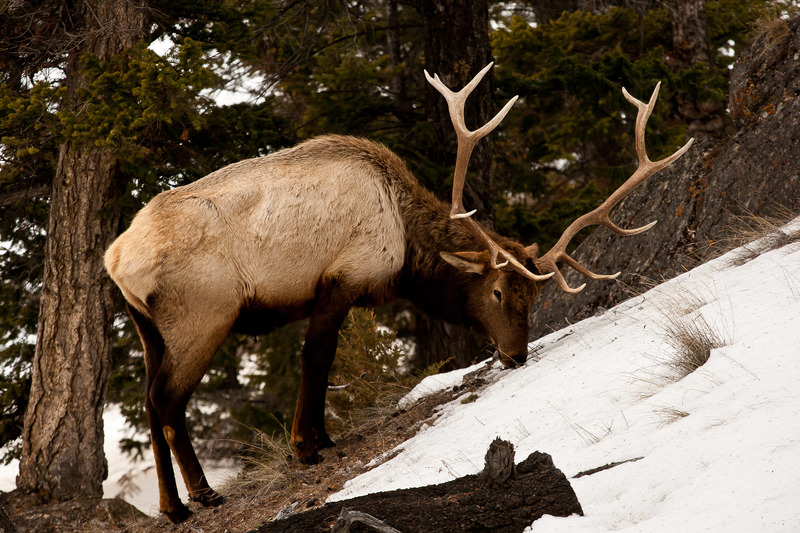 He was grazing along with a few other males earlier in the month, shortly before the snow began to fly in the park. 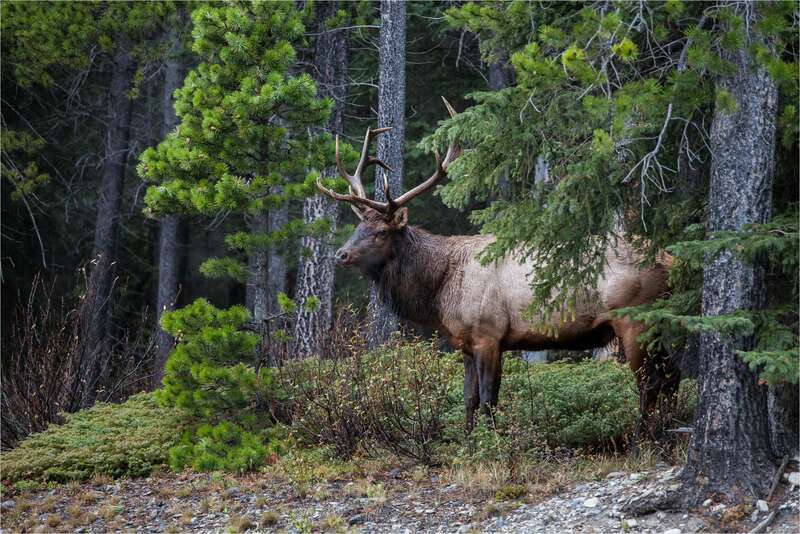 A small herd of bull elk were gathered near Moose Meadows on the Bow Valley Parkway when I was there on the weekend. The frost bleached the grass and the cold air made the breath visible. 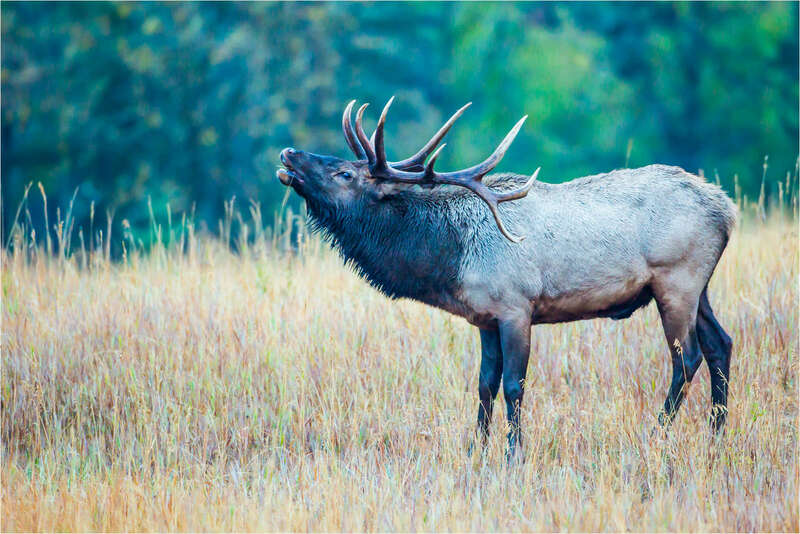 These were mature adults with massive antlers and they were putting them to use. 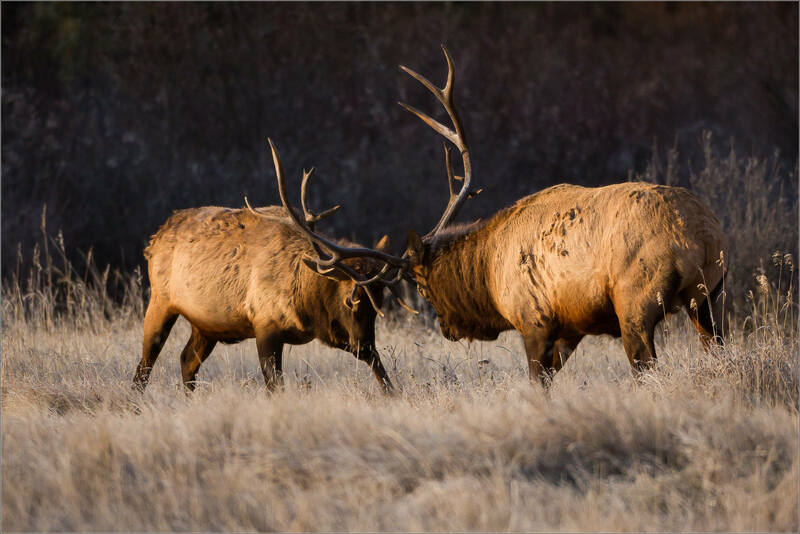 The rut is on and these elk were challenging each other repeatedly. They would be eating grass and then stare at another one. 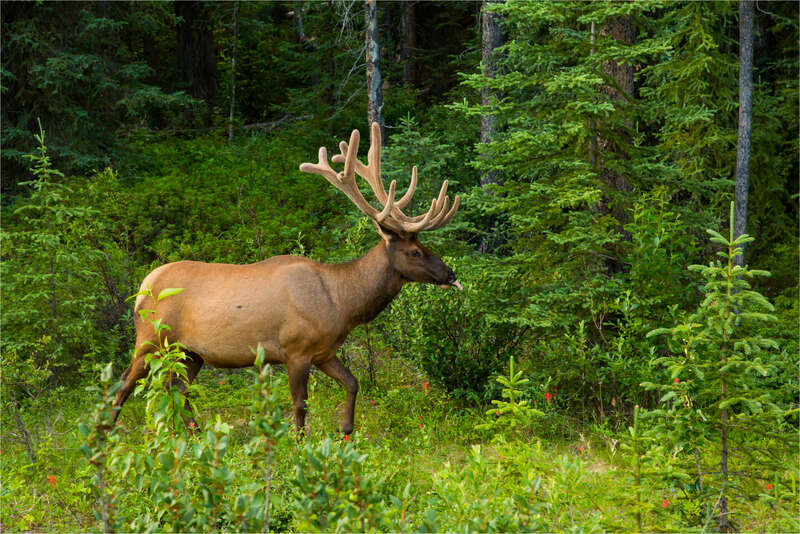 Soon after, they would stalk slowly towards each other and lock antlers. Once entwined, a push and a pull fight would take place. 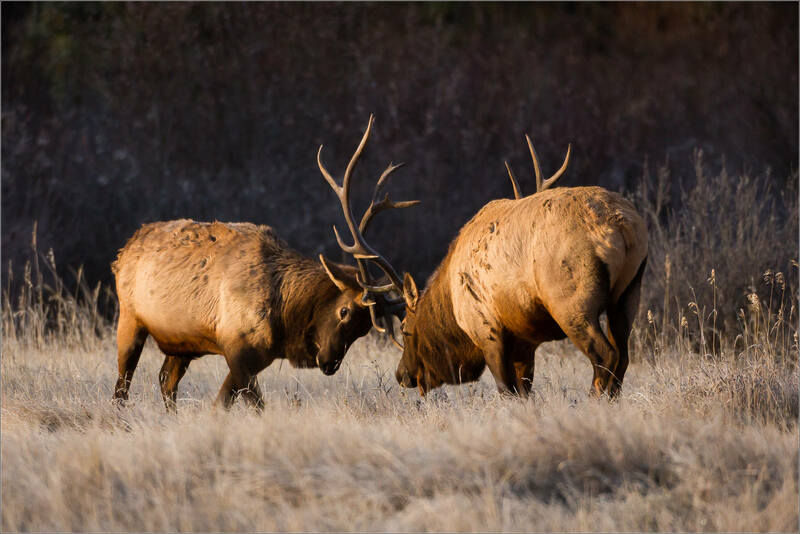 Unlike Bighorn sheep battles where they smash into each other, these were shoving matches. 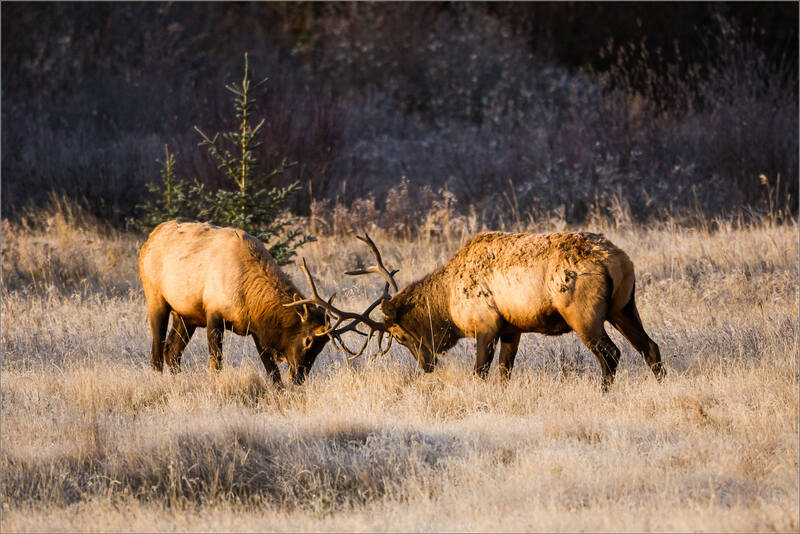 It was a cold morning which made for a particularly appealing scene to watch these giants battle. 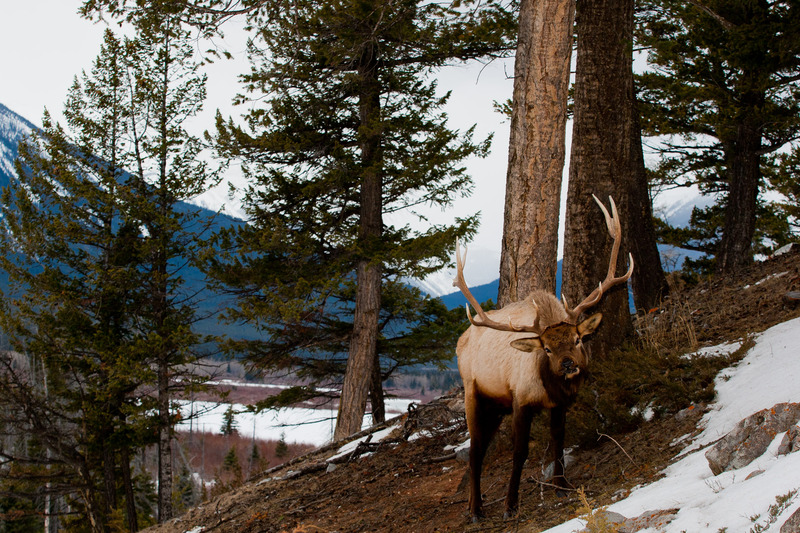 The elk below was noticeably larger than the others and only one bull challenged him in the half hour that I watched. That contest seemed like more of a measuring stick for the smaller one as it was short and there was no real challenge. 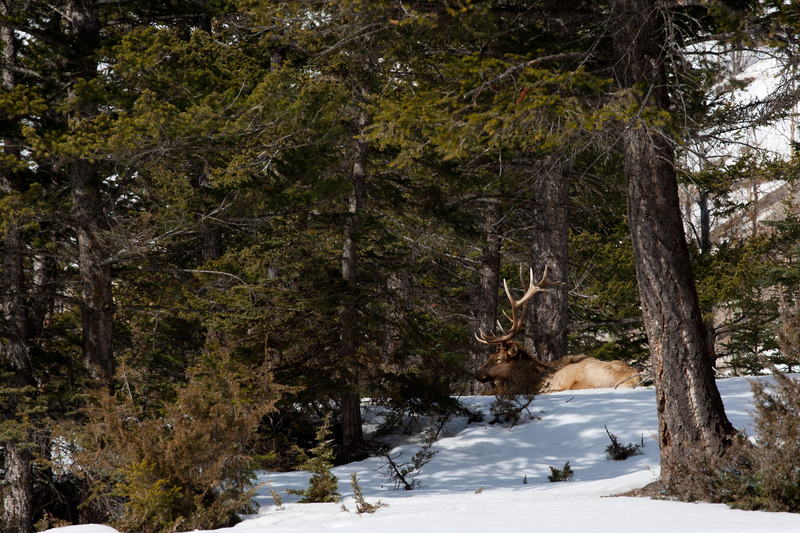 He wandered off after a while heading for the trees and leaving the others to graze and continue the odd skirmish. The trees in the forest were soaked and the rain was still falling as the morning brightened. 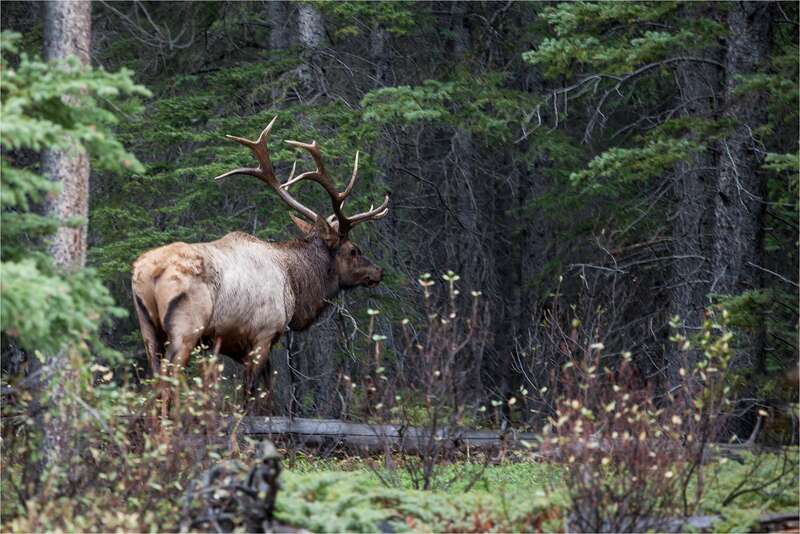 We found a large herd of elk in the woods in the Lake Minnewanka area of the Banff National Park. There were seven or eight cows and two calves grazing, grooming and walking in the shadows. 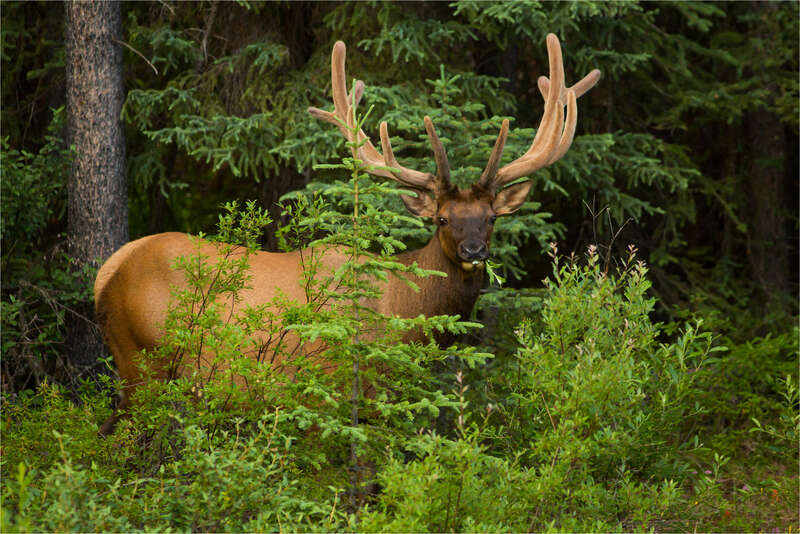 He was back in the forest for quite a while and only came up to the edge of trees for a few minutes before moving slowly back again. Nearby, one of the calves settled down on a patch of grass in a clearing. It seemed to have only a passing interest in its observers. 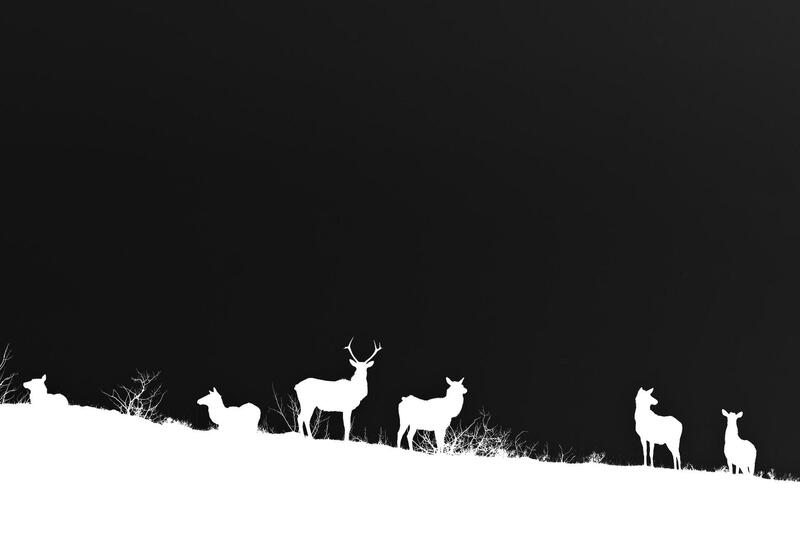 The rest of the family was grazing through the forest. 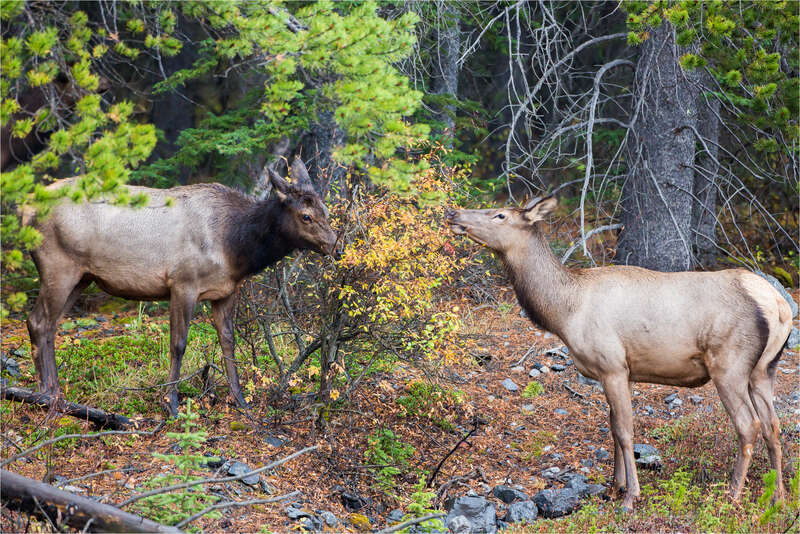 The two below were content to share a clump of colourful leaves for lunch. The bull came back for another lap along the frontline and we left soon after. 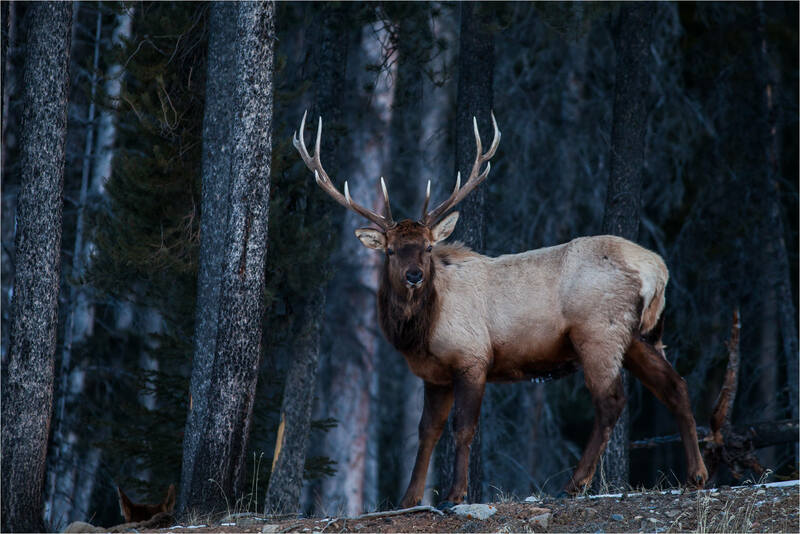 I went up to Banff National Park with my friend and fellow photographer Jeff Rhude on the weekend. The clouds were hanging low all the way from Bragg Creek, through Canmore and into the park so we were unsure what opportunities we would find in the mountains on the day. As the sky brightened a little we could find no breaks in the clouds so we left the sunrise plans on the shelf for another day. 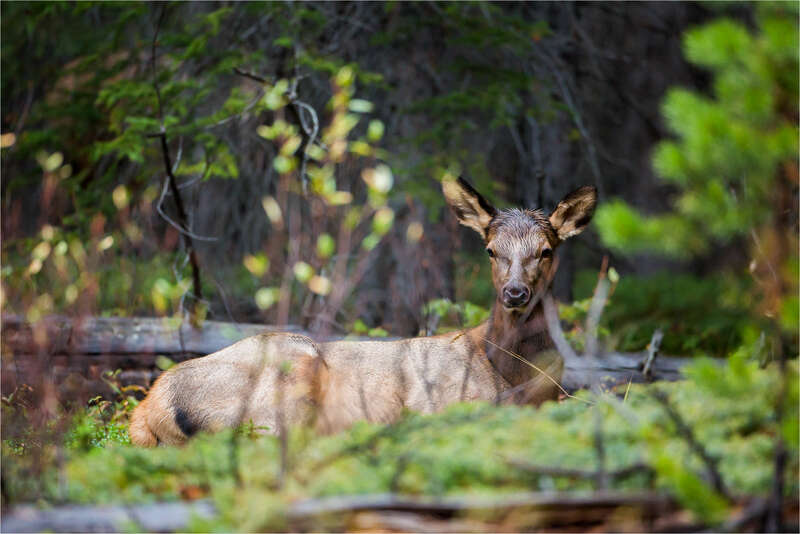 Focusing our attention on wildlife, we headed up to the ring road which leads up to Lake Minnewanka. 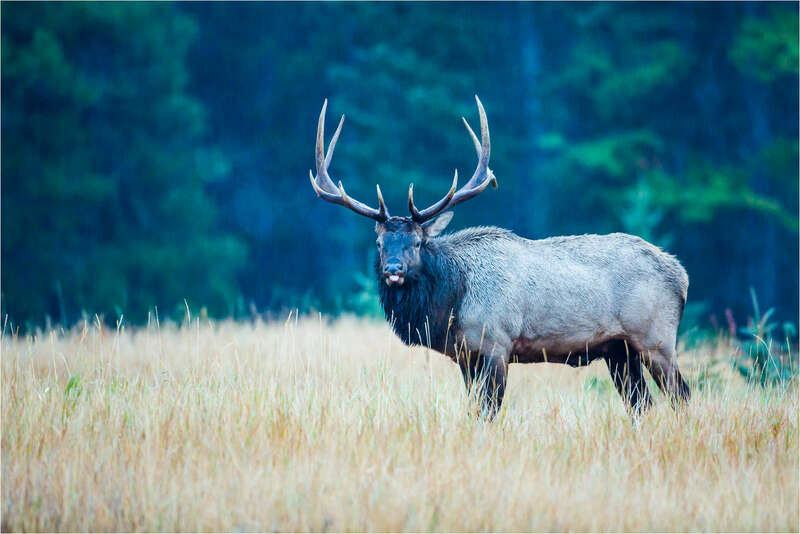 With bears trying to fatten up for hibernation, sheep starting into the rut and moose and elk following suit, we hoped there may be a few animals out in the rain. 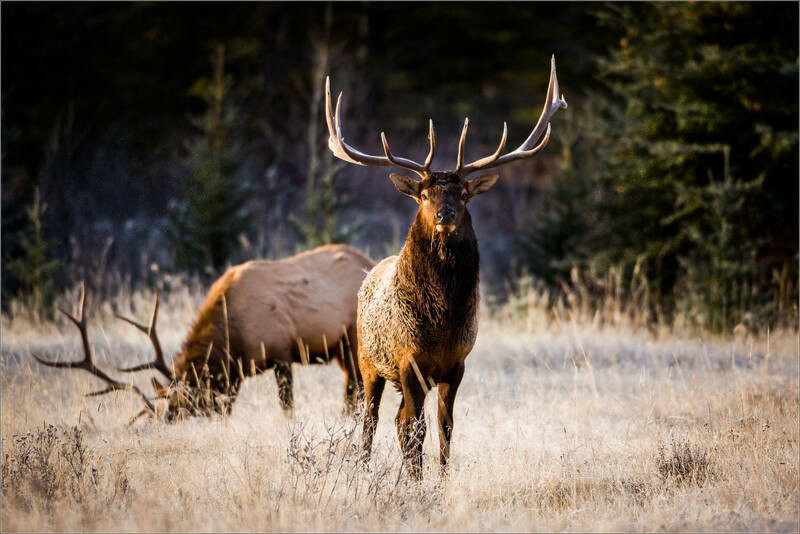 It was the wapiti, the word for elk in the Cree language, that seemed least put off by the weather and we found a small group of calves and cows led by one majestic bull on the meadow approaching the turnoff to Johnson Lake. It was still very dark so high ISOs and long shutter speeds were required which resulted in a few blurs when an ear twitched or one of the creatures stepped forward. Still, the family were cooperative and with the benefit of long lenses I was able to stay a good distance away while making some nice images. Driving on towards the lake, we did not see any other animals. At Minnewanka aside from a couple of mergansers on the water there were two large flotillas of black birds, each probably with over a hundred members, but they were too far out for me to identify. We turned around and retraced our steps. 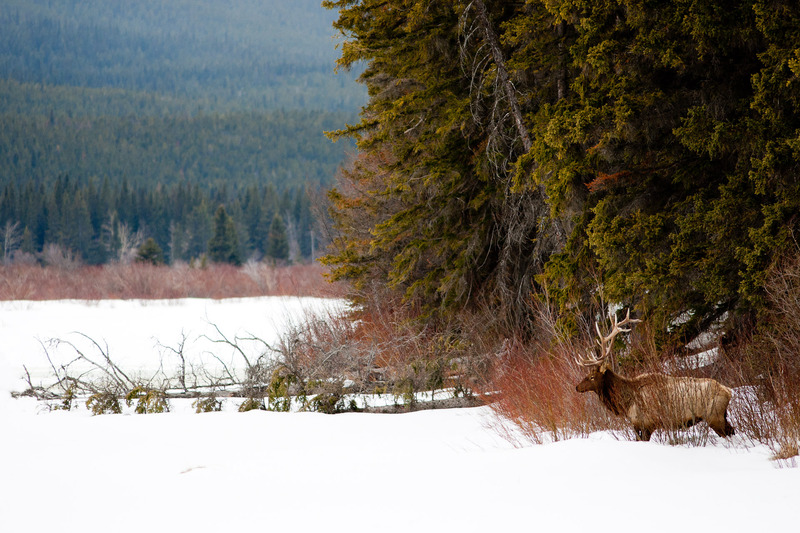 Passing the meadow, we could see the bull on the edge of the trees alongside one calf. 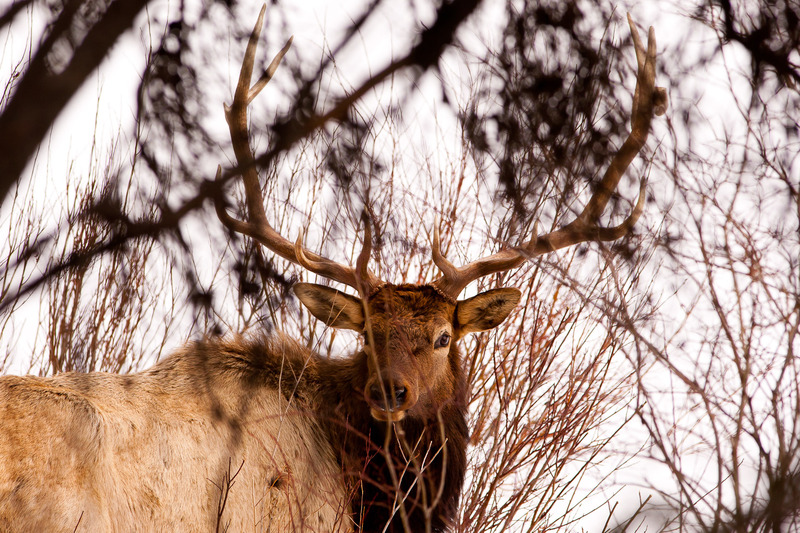 A couple of miles down the road, we caught sight of one elk in the trees. Stopping and looking more intently, we soon saw about ten more cows and calves moving through the shadows and the gloom. I will put together a post with a few of those images soon. 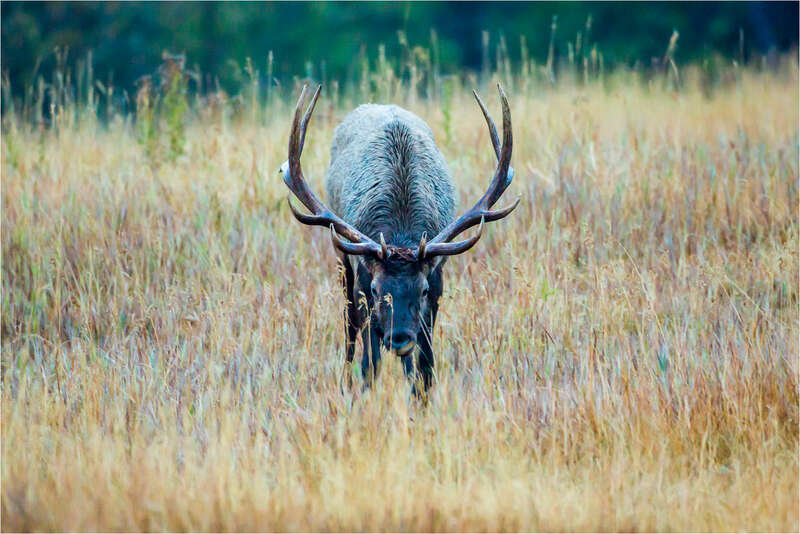 During the trip through the Jasper National Park last month, we found an elk feasting in a vibrant meadow on one of the evenings. 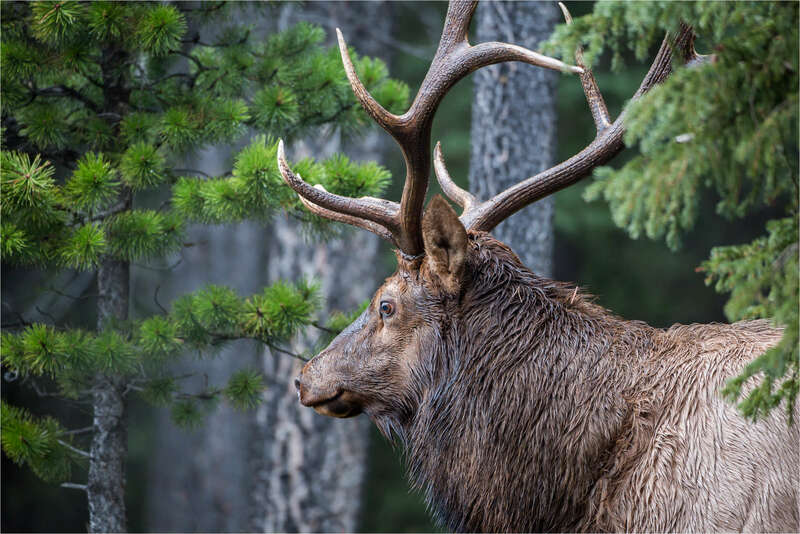 This bull’s antlers were one of the most impressive I have seen on a young elk. 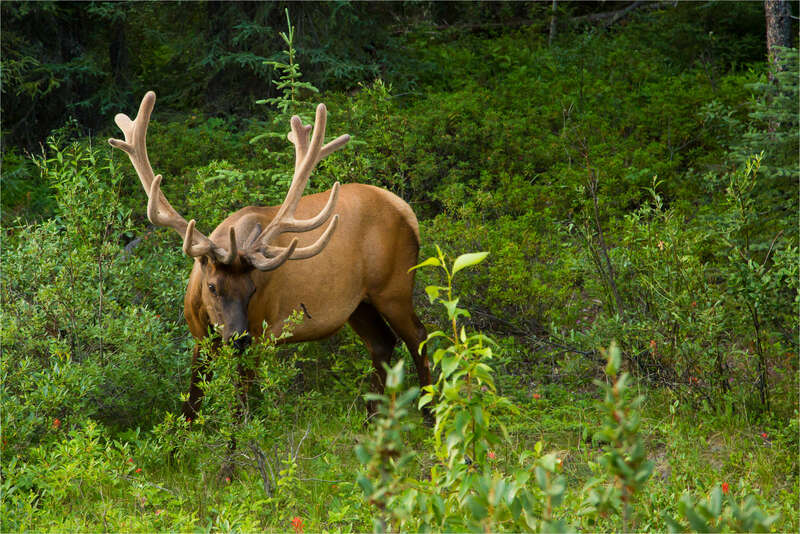 The summer seemed to be moving along well for this beautiful creature judging by the growing rack and the shiny coat. I drove along the Lake Minnewanka road last weekend with plans to photograph the sunrise from a bluff above Two Jack Lake that affords a great view of the lake along with Mount Rundle in the background. 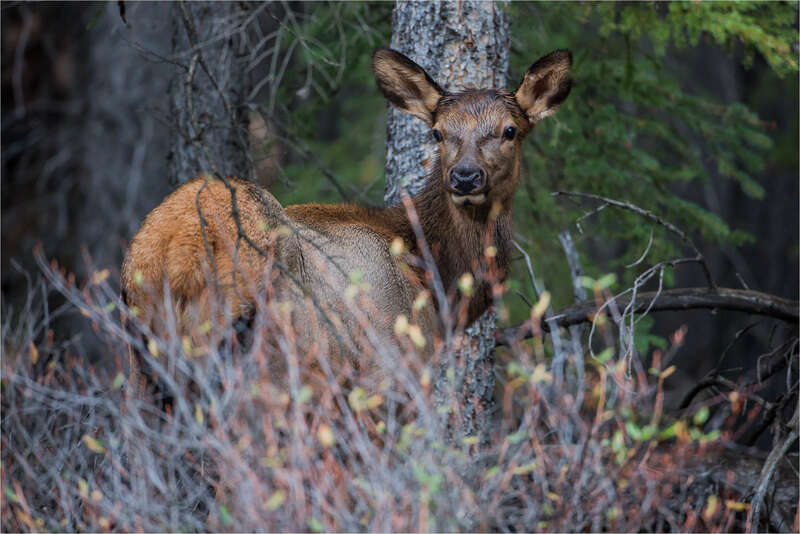 Parking at a pullout near my intended spot, I started setting up my gear when I noticed a female elk standing near a tree about 20 metres away. It was still dark out but I could see her staring at me so we played that game for a few minutes. It was too dark to shoot and she seemed pretty relaxed so I was happy to just watch her. 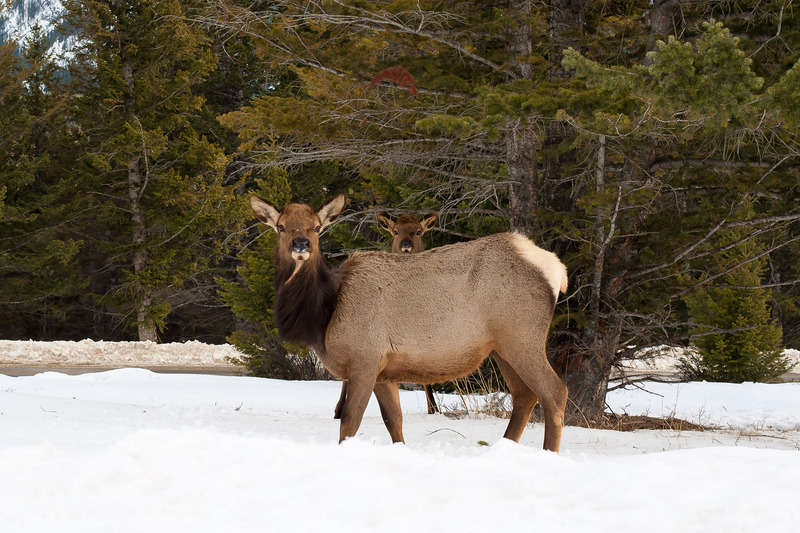 Then, I saw some movement behind her and a bull elk stood up and shook the snow off. 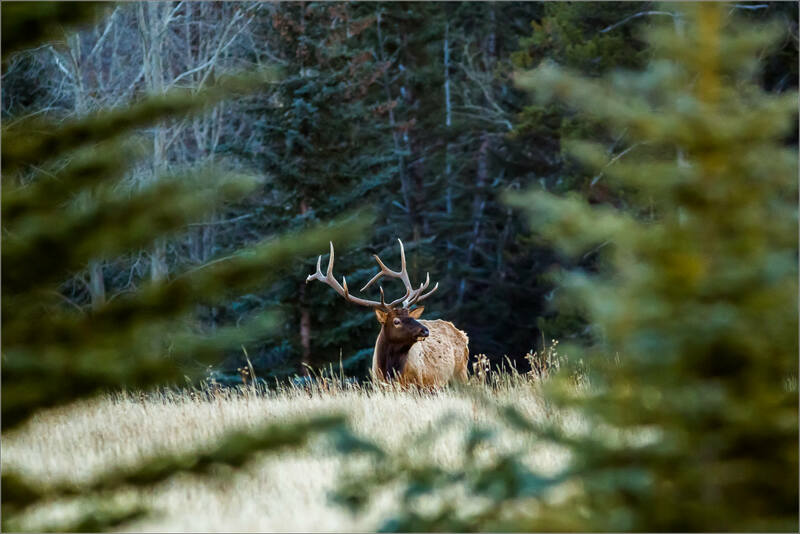 She might have been happy to stay there but he wanted to get a bit of separation so they hopped the snow bank onto the road and, after clearing the bank on the far side, climbed the hill to the edge of the forest. At this point, the light was brightening quickly and by raising the ISO on my camera I was able to take the image above of the bull staring at me from the top of the hill. I thought they were going to continue into the forest but when I reviewed the picture in the LCD on the camera, I noticed the female’s ears in the lower left corner of the picture and realized she was laying down. 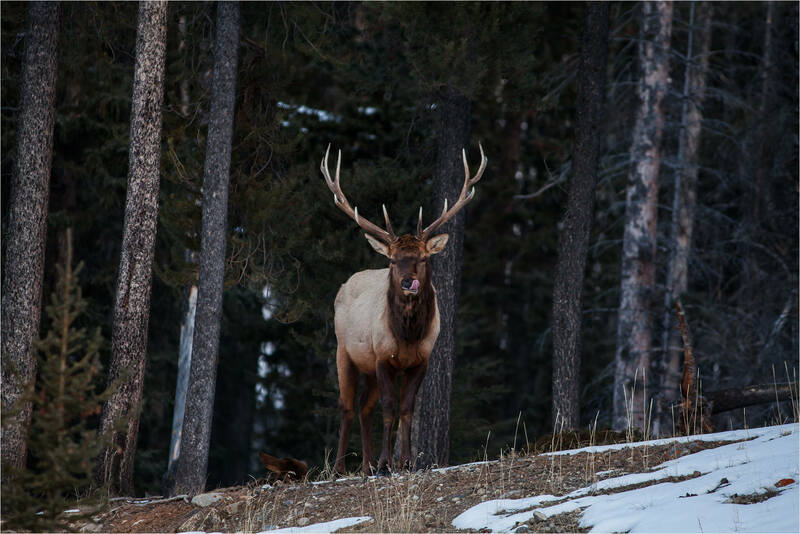 They were in no hurry to disappear so I stayed on the far edge of the road from them and photographed the bull with his amazing antlers. These are among the best balanced racks that I have seen and one of the largest. Really impressive and when he licked his chops I had a fleeting image of him using them on me. That idea didn’t take hold as his body language did not suggest any agitation. 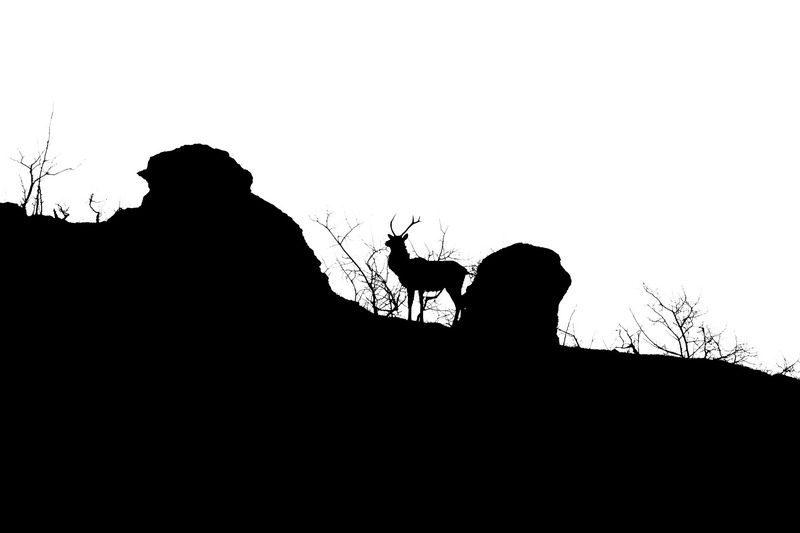 He stayed on this little rise for the time while I was there and the cow got up once but stayed low and mostly out of sight. I tried not to take it personally when he stuck his tongue out. It’s a funny look that’s hard not to anthropomorphize a bit. 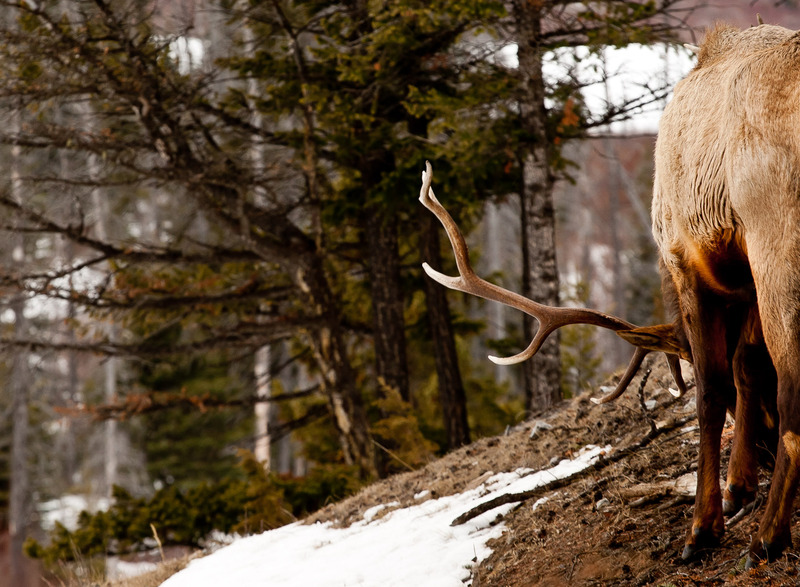 Even while scratching his leg, the elk kept one eye on me presumably to avoid being surprised by any movements I might make. Switching lenses for a wider composition you can see the first light colouring the peak of Cascade Mountain above the forest. 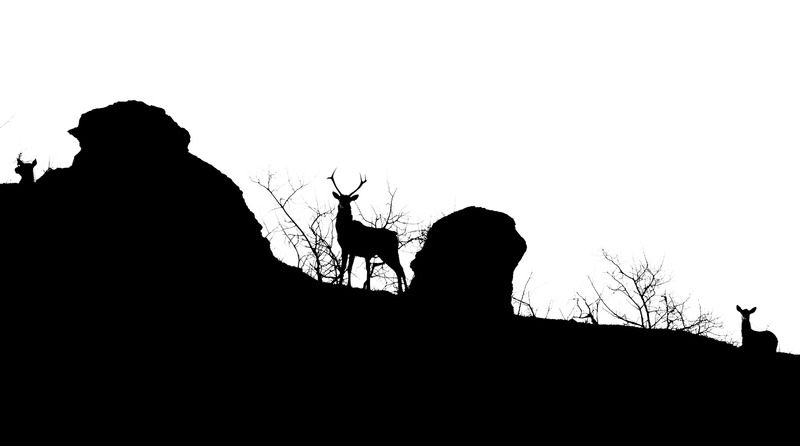 I left them just before sunrise as he was turning his attention towards the trees. 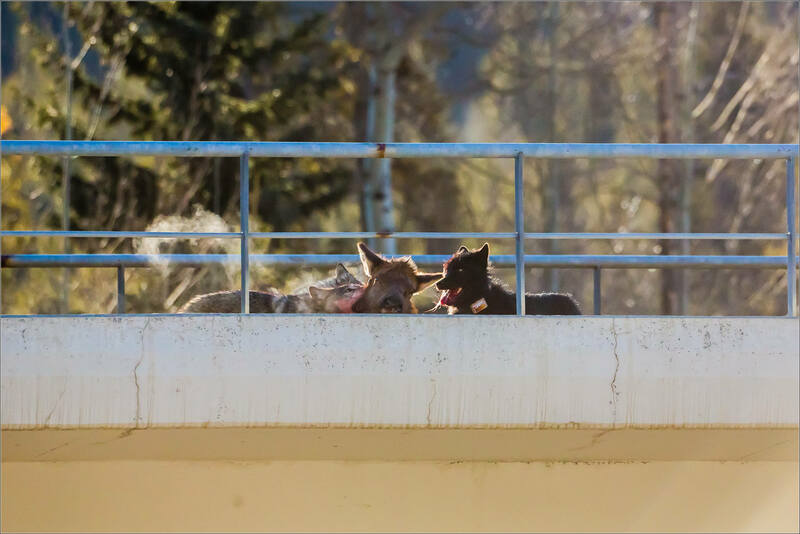 I piled my gear back in the car and headed down to the Bow Valley Parkway and, as it turned out, to a pair of wolves. 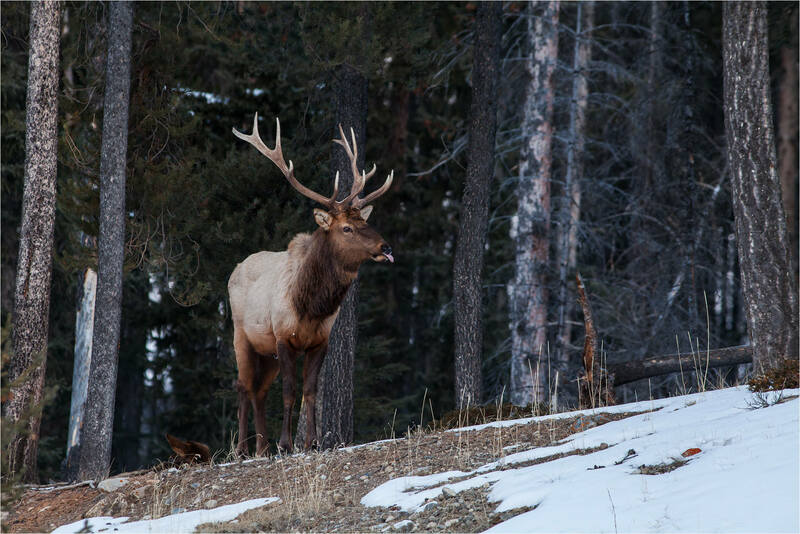 The Sibbald Herd is a large group of elk that forage west into the front range of the Kananaskis mountains and east to Springbank near Calgary. 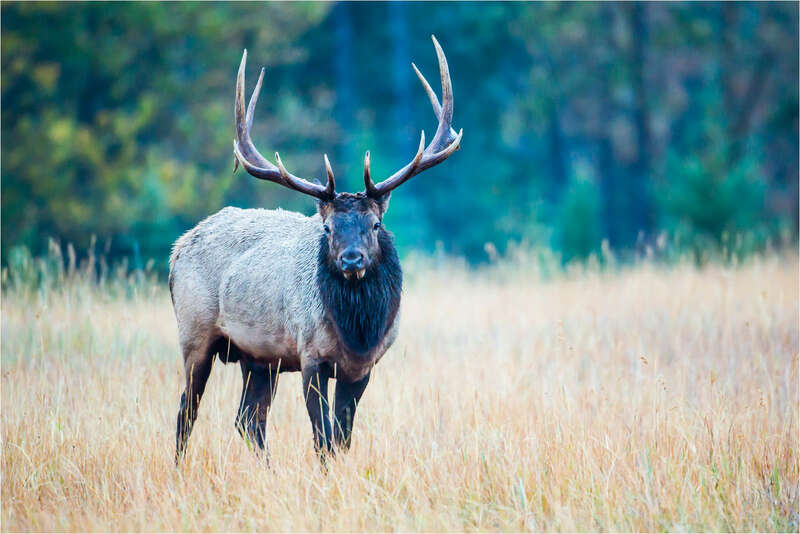 They move within a relatively thin band along the eastern part of their land and are often in the scrub brush that edges the farmland along Highway 22 between Highway 8 and the Trans Canada Highway. 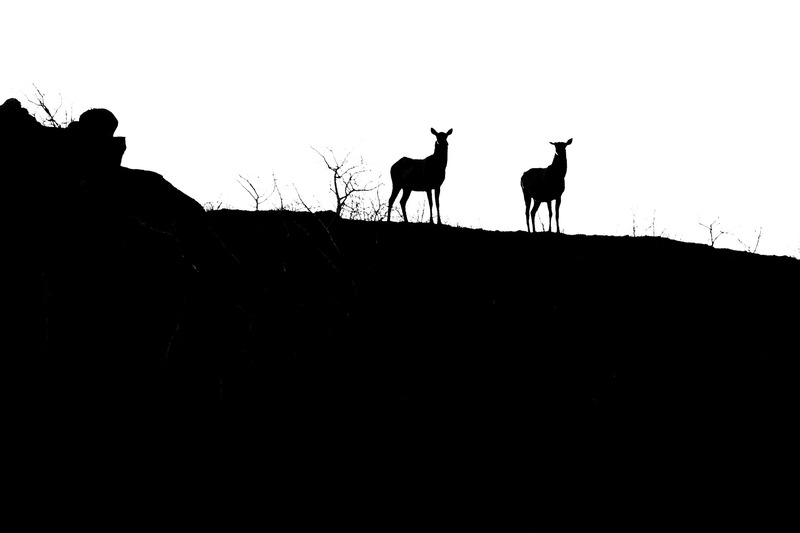 They often graze behind this ridge in a shallow valley but on this morning I found them lined up among the trees and the rocks. 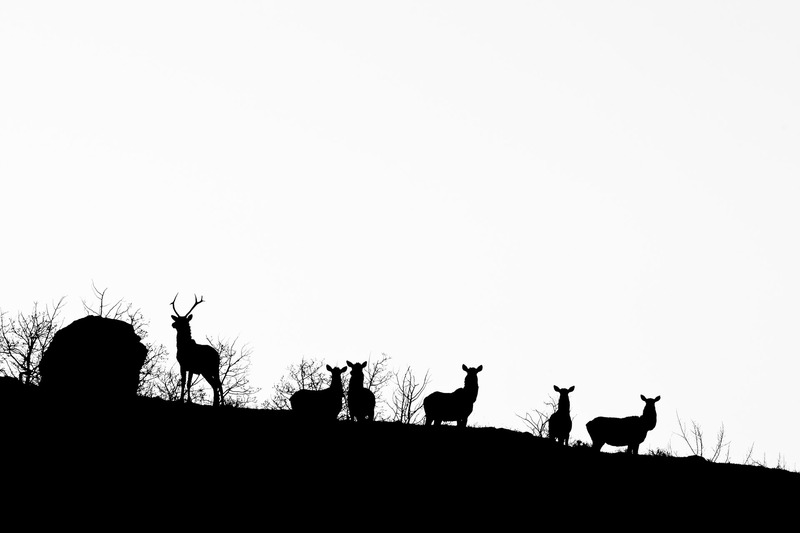 They were quite interested in my for a couple of minutes and then resumed grazing and wandered back behind the hill. 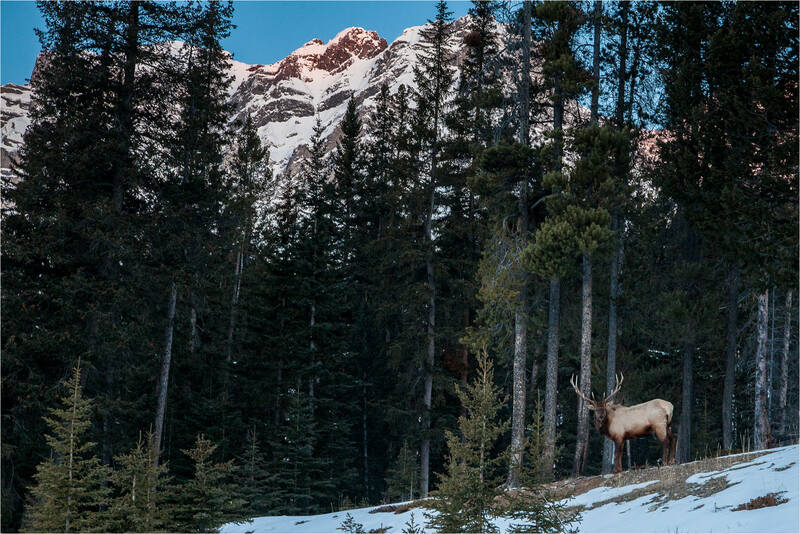 I photographed these animals about an hour after sunrise with the sun still below the crest of this ridge. The strong backlighting made for wider range from dark to light than my camera can capture so I chose to work with the structural elements within the scene. 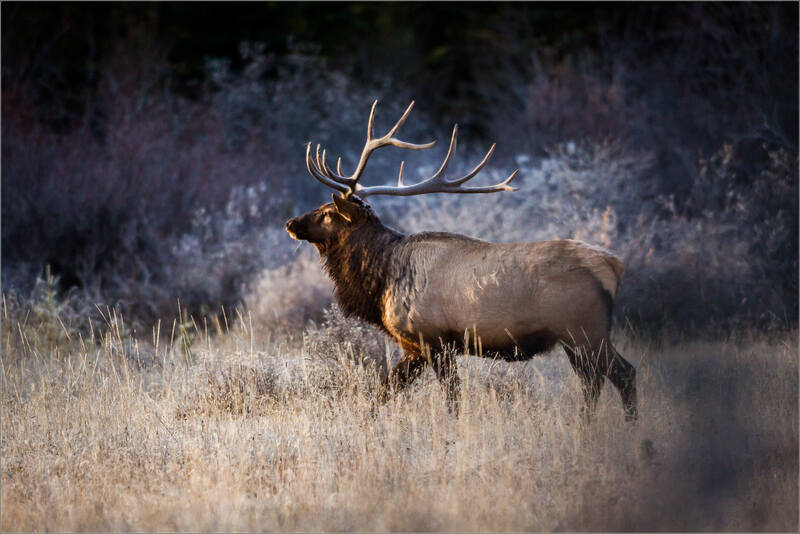 Reduced to black and white, there is an interesting relationship between the land and the elk highlighted in these pictures. Playing around on this last one. I like how the white bushes look like splatter paint.